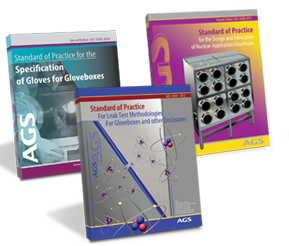 The American Glovebox Society (AGS) is a non-profit organization formed in Denver, Colorado, in 1986 to promote safety and quality of glovebox systems; promote communication; disseminate knowledge in the field of glovebox technology through symposia, publications and other media; and recommend standards and guidelines for glovebox technology to existing national and international associations, and promote adoption of such approved standards to reduce costs, both fabrication and operational. The definition of a "glovebox" as used by the Society includes enclosures, barriers, and isolators. The art of glovebox technology is advanced through the AGS by dissemination of information. The Society accomplishes this in a variety of ways, including organizing an annual technical conference and equipment exhibition; publishing a quarterly newsletter, The Enclosure; and generating guidelines. The Society is guided by elected Officers and a Board of Directors. They are elected annually by ballot of the Society membership. Please use the AGS Products & Services Directory to search for products and services.